I found Keepsake last Christmas when I was on the hunt for an easy way to give framed photos of the girls as holiday gifts. I had some nice photos I wanted to share with family, but with a newborn and business to run, I did not have time to go browsing through stores, looking for the perfect frames in the correct sizes. I remembered seeing an ad on Facebook for a company that sold nice-looking framed prints from your phone, and a quick Google search led me to a few options. I settled on Keepsake for the ease-of-use, price, quality, and frame style choices. Keepsake's 'york' frame in gold, 8" x 8". This is an Instagram photo I took of the girls. This one was a gift for my husband, which he took to his office. Cost - $29. Place your order via Keepsake's website or download their app to your smartphone. You can select photos from your computer/phone, choose your frame size and style, and checkout. I used their iPhone app. Pretty simple, and I was pleased with the style options - just enough to find something you like without being overwhelmed by choices. Keepsake's 'siena' frame in white, 5" x 7". This is the photo we used on Ginny's birth announcement. I ordered two of these frames - one for each set of grandparents. Cost - $29 each. Pros: Easy to use, reasonably priced, convenient, nice style choices, good quality prints and frames, free shipping, made in USA, and the frames are pre-mounted with brackets for hanging on the wall. Cons: The stands that come on the frames for table display are not what you're used to. They work, but can also easily detach when you pick the frame up. Also, while the paper backing on the frame adds a professional touch, I don't know how easy it would be to try to change the photos later if you wanted to reuse the frame (but I'm not too worried about that for now). Back of the 'siena' frame. Pros = sturdy hanger hardware is pre-mounted + little cork bumpers are included to protect your walls. Con = the stand attachment for table display comes off too easily. I liked Keepsake enough to not delete their app from my phone immediately after I used it. That's saying something. They're my go-to for gifts of framed prints of the girls from now on. 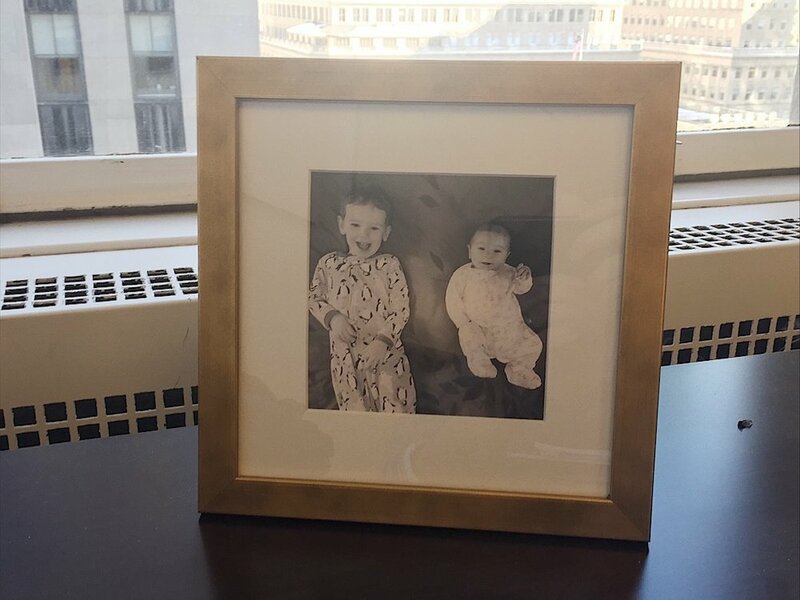 Have you used Keepsake or another framed-print company? Tell us about your experience in the comments below, and help others find the businesses you love.